So while Porsche clearly hasn't messed with the classic 911 styling on the outside, what is new for this eighth generation model (the 992) is a redesigned interior. Porsche says it has drawn inspiration from the straight lines of the 1970s 911 for the design. It gets a 10.9-inch touchscreen, virtual dials (either side of the traditional central rev counter) plus a new gear selector on PDK models. It also has a online navigation system (which works in a similar fashion to Waze) and Porsche Connect Plus. Porsche is sticking with the flat-six turbocharged engines of the outgoing model, but as you'd expect they have been 'further developed' for more power. 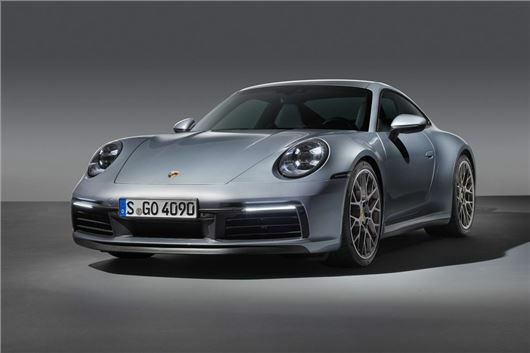 The S models have 450PS as standard and Porsche is promising better fuel economy plus there's a new eight-speed dual clutch PDK automatic gearbox. Thanks to an extra 30PS over the previous 911, the Carrera S models can cover 0 to 62mph in less than four seconds (3.6 seconds for the 4S and 3.7 seconds for the rear-wheel drive model if you're counting). Opt for the Sport Chrono Package and it knocks a further 0.2 seconds off that time. Official economy is 31.7mpg for the Carrera S and 31.4mpg for the 4S. While it looks little different from the previous model, it is slightly wider and there's now no difference in the width of the rear shoulders between models. It also gets electric pop-out door handles and the entire outer skin is made from aluminium. At the rear there's the light bar that stretches across the width of the car and has become a Porsche design feature across the range. Standard features on the new 911 include Wet Mode. This can detect if there's water on the road and will ready the control systems and warn the driver, who can then put the car in a setting designed with the emphasis on safety. The 911 Carrera S Coupe with PDK costs from £93,110 and the 911 Carrera 4S Coupe with PDK from £98,418.